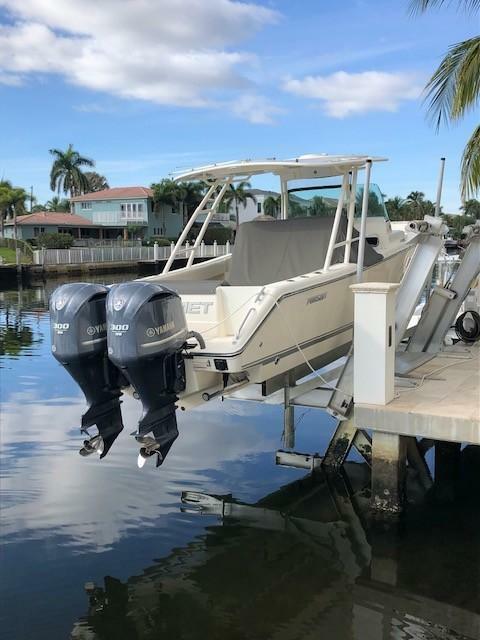 "Kismet" is a lift kept boat that has been lightly used for ICW cruising. 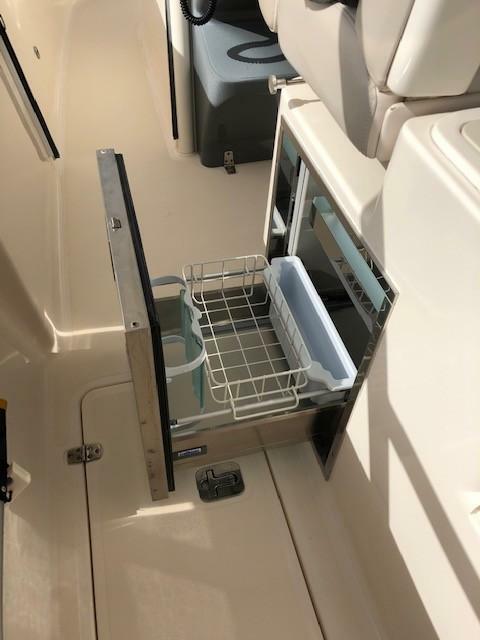 Well maintained by it's original owner this ST310 is ready for it's new owner. 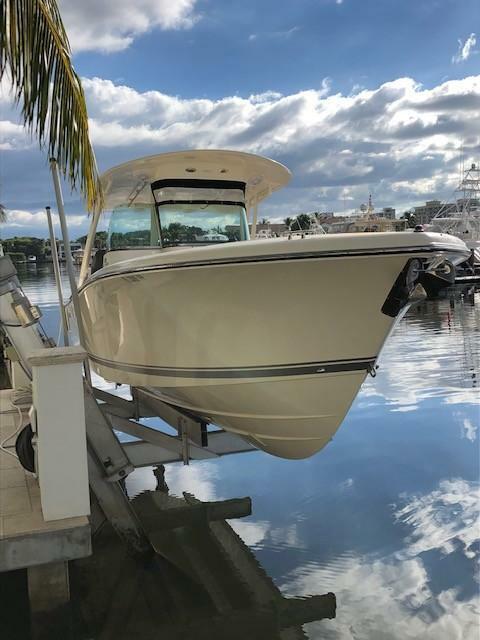 Starting at the bow, the ST 310 delivers full wrap-around lounge seating with angled cushions ergonomically positioned for comfortable entertaining. 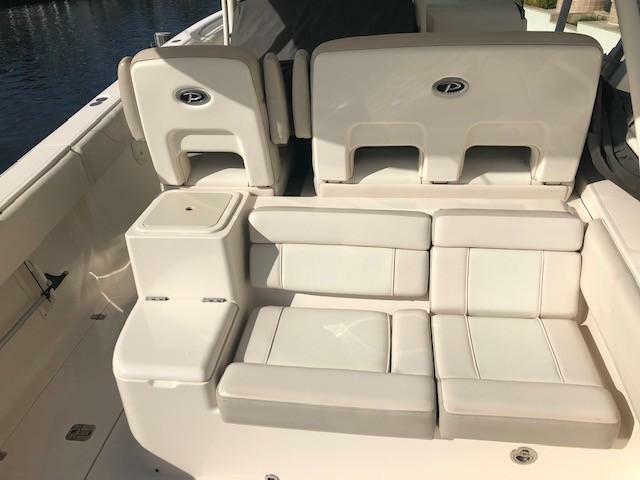 A convertible fiberglass table accented with Corian Pursuit details doubles as a base for the portable sunpad filler which turns the bow into one large sunbathing platform. 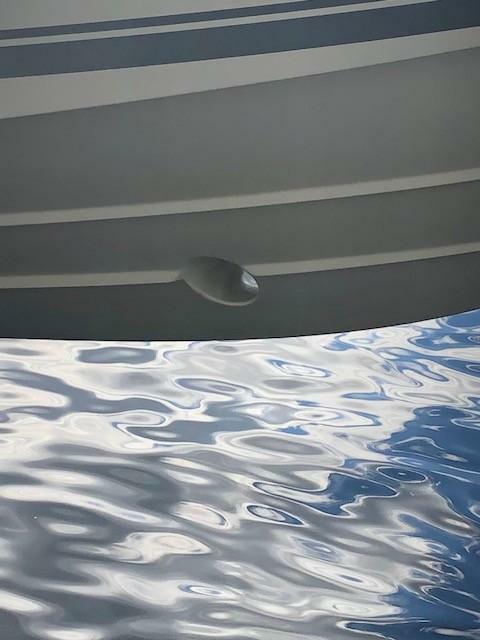 Recessed, stainless steel hand rails are neatly anchored just behind the forward seating for safety and security underway. 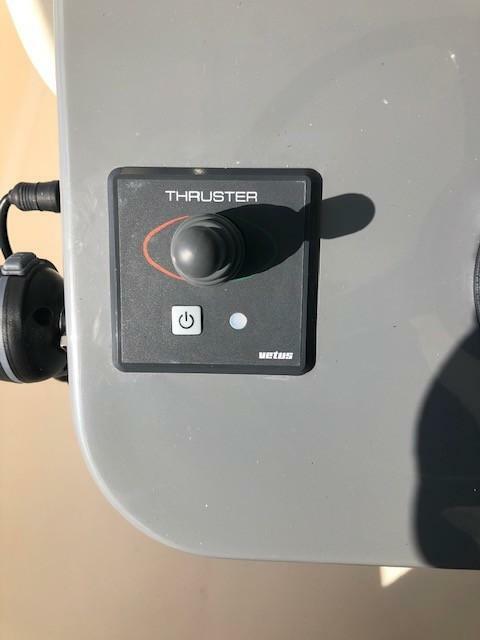 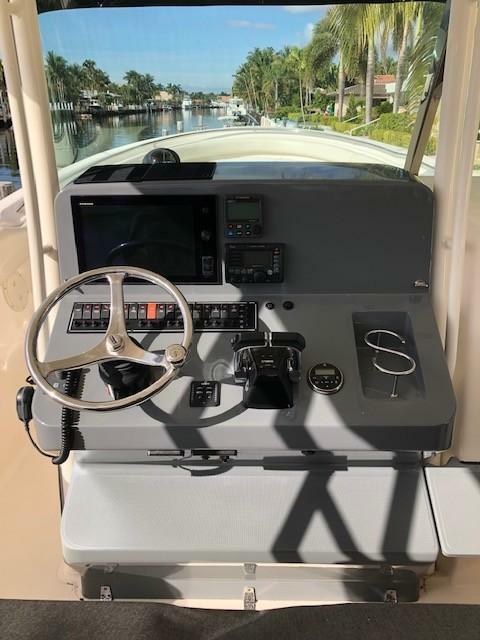 Entry to the console and head compartment is accomplished through a custom molded fiberglass door installed with heavy duty hardware and latching system complete with a stainless gas spring. 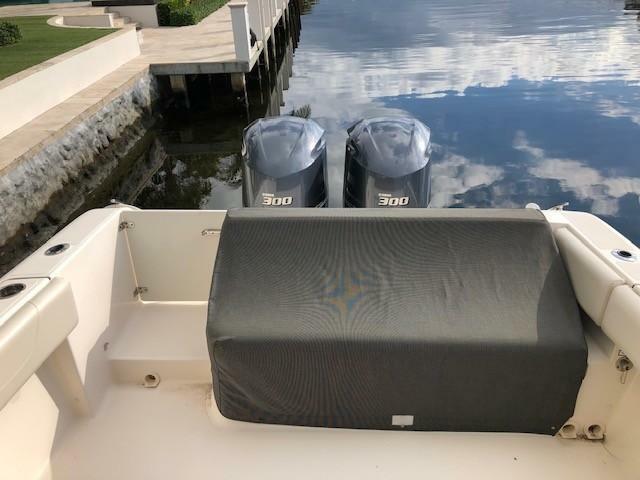 Dive tank and equipment storage engineered below allows you to secure gear out of the way and off the deck. 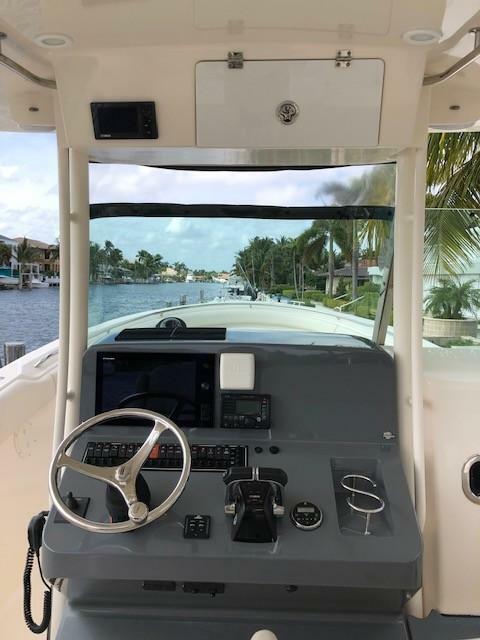 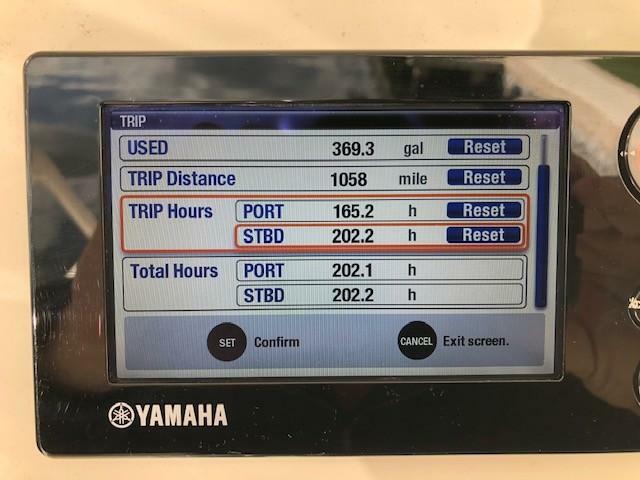 The ST 310 is outfitted with a uniquely curved triple-wide windscreen designed to keep a Captain and companions cruising at speed without getting wind-blown. 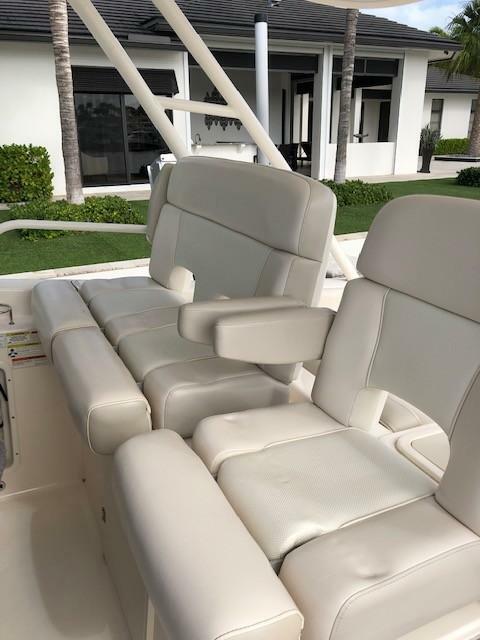 Seating for three includes a separate adjustable helm seat with arm rests along with double wide companion seats to starboard. 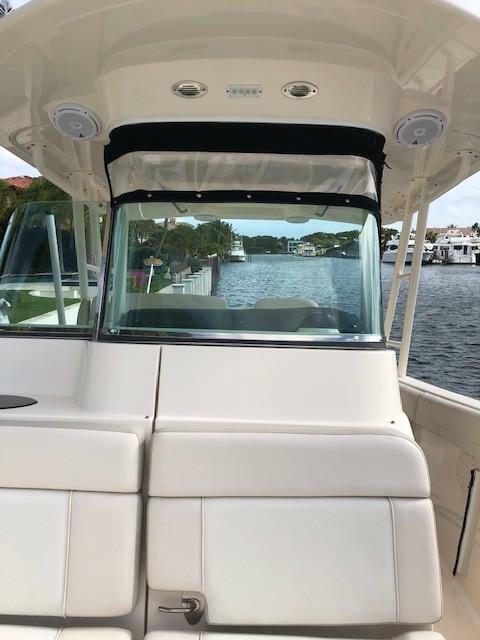 Overhead, the surfboard styled hardtop has dedicated installation details on the topside for outriggers, radar, lighting and antennas. 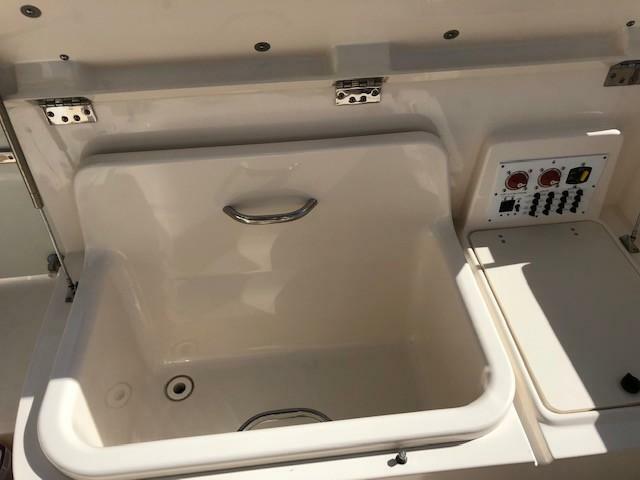 Underneath, the top is finished with built in hand rails, molded speaker ports and an electronics box. 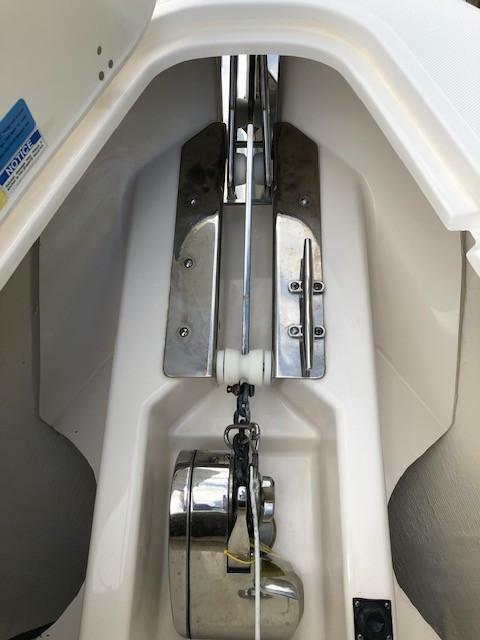 All supported by white, powdered coated, heavy duty aluminum tubing. 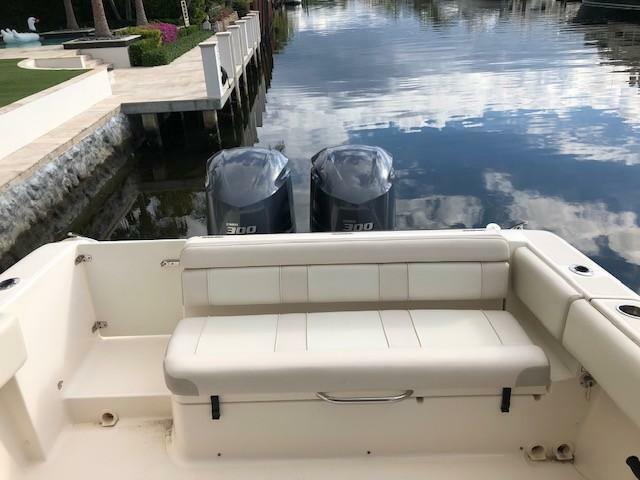 Aft facing seating and forward facing transom seating accommodate as many as six additional guests with softly cushioned upholstery designed to cradle the body just so. 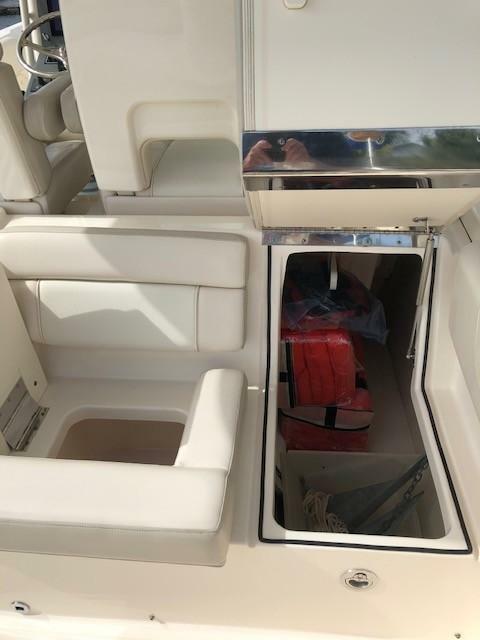 Included in the seating closest to the helm are a sink, livewell and insulated cooler. 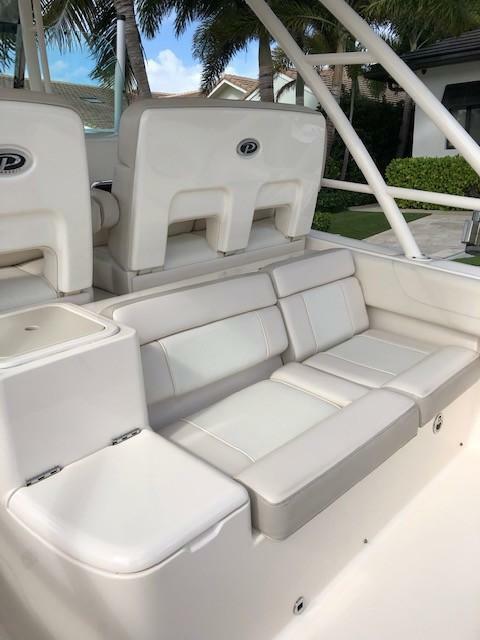 To the starboard side a hinged seat portion opens to reveal cavernous storage large enough to conceal fenders, lines, safety equipment and racks for fishing rods or marine related equipment. 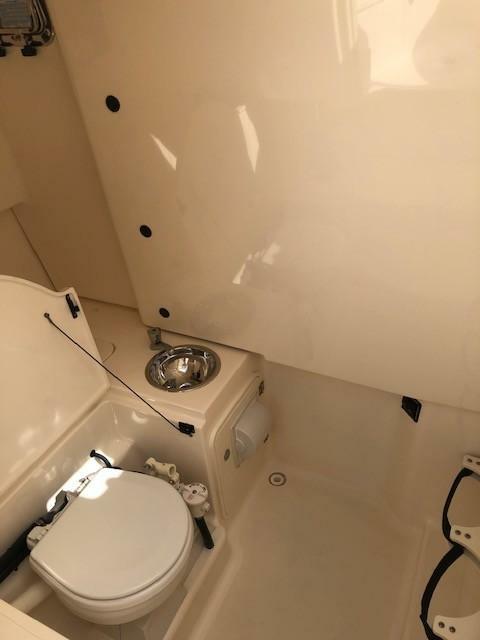 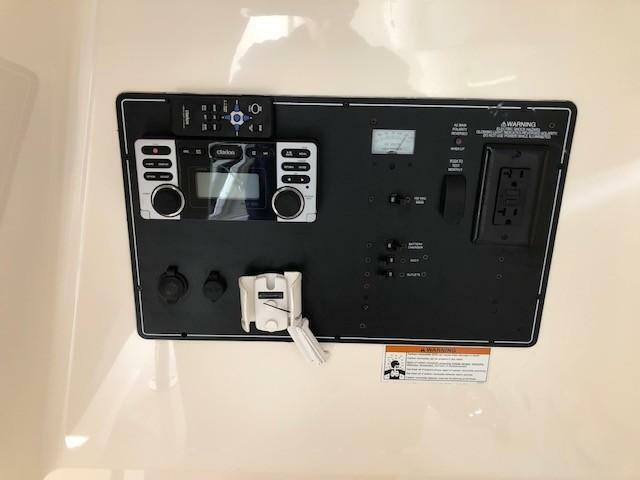 The transom lounge hinges aft and features a large removable bin that allows access to the aft bilge and mechanical systems. 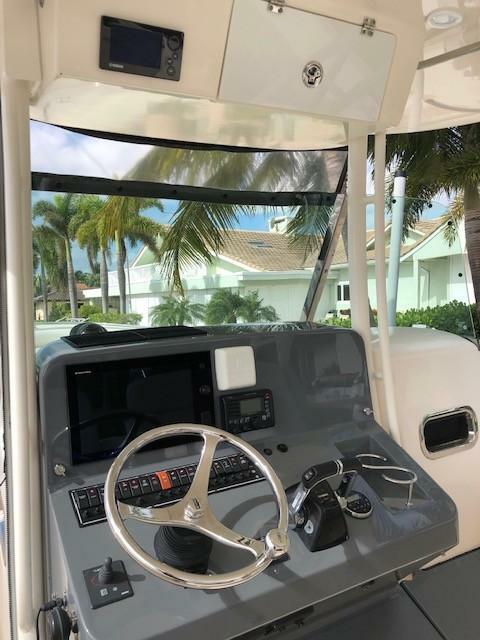 Built-in swim platforms with hidden dive ladder and hand rail, an insulated in-floor fishbox, properly located drink holders and gunnel-mounted rod holders are just a few of the noticeable details that finish off the cockpit. 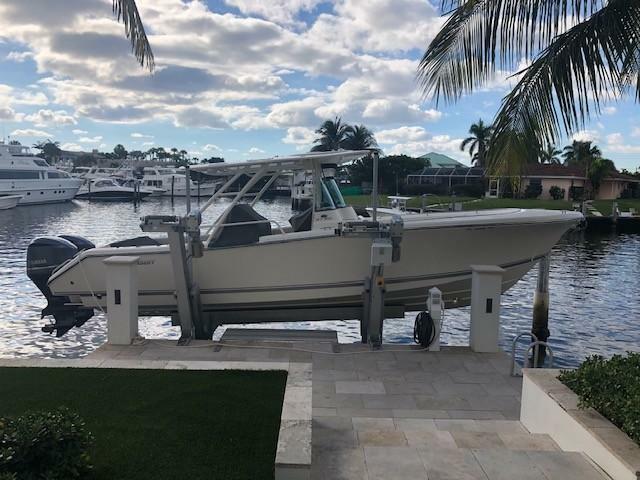 Underneath your feet an aggressive 24 degree deadrise, sharp entry, performance minded chines and strakes bring this vessel to life providing a comfortable platform capable of fishing, diving or just transporting an extra large offshore party to your favorite coastal getaway. 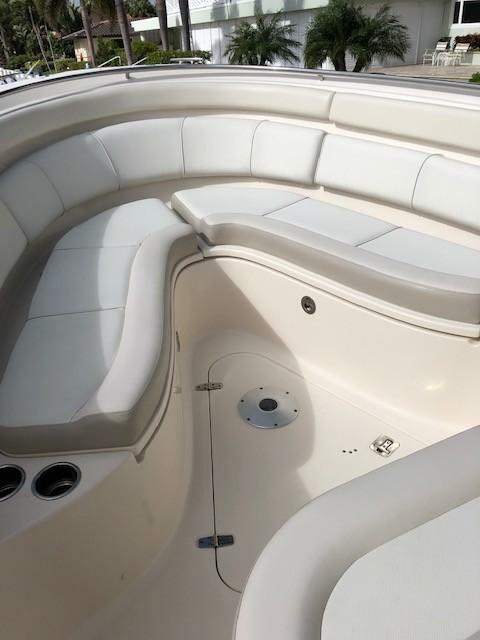 • Molded bow seating w/cushions; insulated, self-draining and lockable boxes. 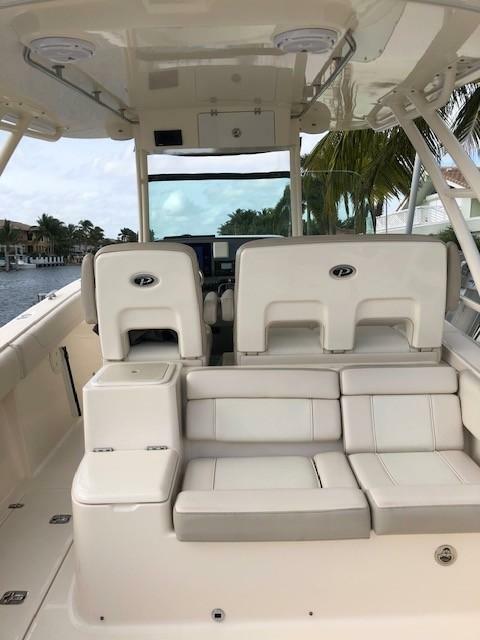 • Aftfacing seat w/storage compartment for six docklines, life jacket bag, fenders and rod rack.